Join Queen Elizabeth I and her court of knights, troubadours and wenches at this most royal of banquets and enjoy a three course feast with ale and wine in the majestic surroundings of Invercargill's historic Masonic Lodge. 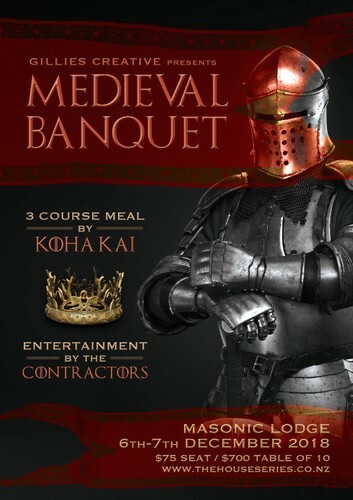 The banquet will be cooked by the team at Koha Kai, and served to share with your table. Come in costume and enjoy entertainment provided by The Contractors, including past and present Southland Entertainers of the Year Steven and Lachie Hayes. A cash bar will be operating. So get your workmates together and celebrate the end of another year with an evening you won't forget!